The Toronto Blue Jays finally are moving up from the Third Division after three straight near misses. They are joining the Cleveland Indians, who romped through this group. 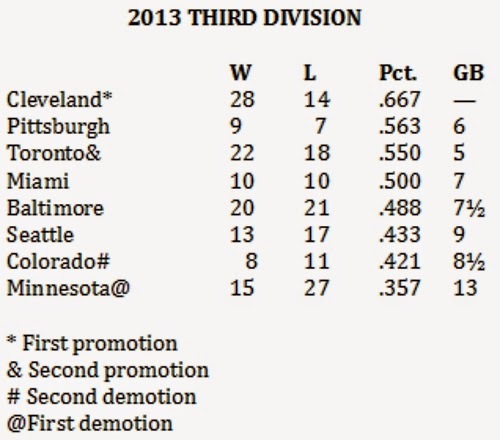 On the other side, the Minnesota Twins and Colorado Rockies are being demoted together for the second straight season. They're both headed to the Fourth Division in 2014. The Toronto Blue Jays are the perennial bride's maids in the Third Division, never finishing more than two games from promotion in the first three years of these standings. At last, they move up. The Jays finished 22-18 in 2013, second place in games (five behind), though third in winning percentage (.550). The Pittsburgh Pirates finished 9-7 and would have nosed out the Jays if they had won one more game. The Cleveland Indians trounced through this group with a 28-14 mark, so they receive the first promotion to the Second Division in 2014. The Indians have climbed slowly, but steadily, needing two years to pass though the Fourth Division, then another two years to pass through the Third Division. The Minnesota Twins and Colorado Rockies have become partners in futility. Both are being demoted for the second straight year, so they are headed to the Fourth Division in 2014. The Twins have fallen from the First Division to the Fourth Division in the shortest possible time, taking three straight demotions.